Civil society leader and president of the Union of Palestinian Women’s Committees Khitam Saafin was released from Israeli prison on Sunday after being held without trial or charge since July 9, Palestinian prisoners’ rights group Addameer reported in a statement Monday. Saafin was detained during a predawn military raid in the village of Beituniya in the central occupied West Bank, the same night Israeli forces detained Palestinian Legislative Council (PLC) member Khalida Jarrar. 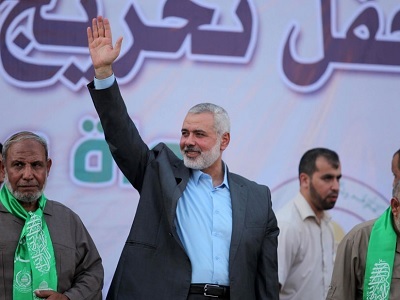 Both were later sentenced with administrative detention, Israel’s widely-condemned policy of interment without trial or charge based on undisclosed evidence — Jarrar for six months, and Saafin for three. Saafin, 53, is the president of the Union of Palestinian Women’s Committee and has spoken internationally and participated in many worldwide events, including the World Social Forum, linking women’s struggles internationally with the struggle of Palestinian women for national and social liberation, according to Addameer. 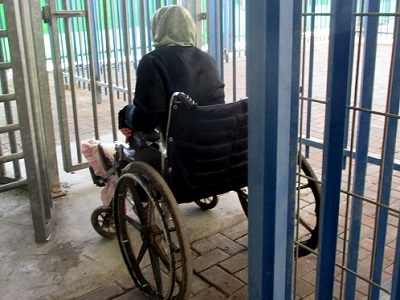 The group says that 450 Palestinians are currently placed under administrative detention, including five female, one child, and nine PLC members. “This practice of arbitrary detention is a grave violation of international laws and human rights standards, particularly articles 78 and 72 of the Fourth Geneva Convention which state that an accused individual has the right to defend himself. This also violates Article 66 of the Fourth Geneva Convention and the basic standards of fair trial,” Addameer said in its statement. 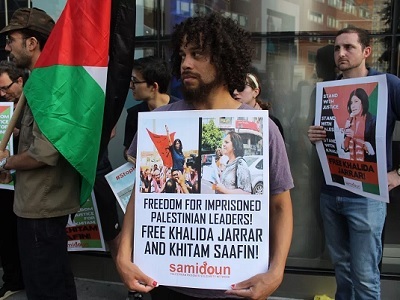 Leftist political parties and social movements from around the world condemned the detentions of Saafin and Jarrar, who both have leading roles within the Popular Front for the Liberation of Palestine (PFLP). I am from Vancouver,Canada and I wanted to say that it is good news that Khitam Saafin was released from the Apartheid Israeli prison.Khalida Jarrar also should be released from prison.All Palestinian Political Prisoners should be freed from Apartheid Israeli prisons.There is no place in todays world for Apartheid Gov’ts like there is in Palestine.